After a delightful brunch at Clinton Street Baking Co., Jess and I headed over to Doughnut Plant to pick up some doughnuts to save as afternoon snacks. I've read many reviews about Doughtnut Plant and received many recommendations from friends to make a detour here. 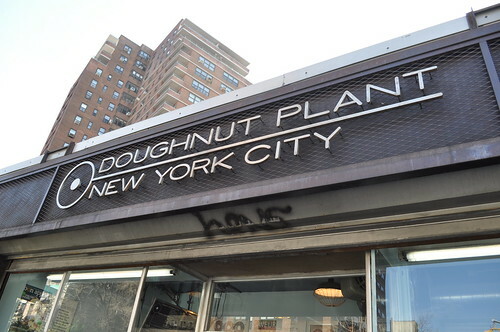 Started in 1994, Doughnut Plant was created by Mark Israel, using his grandfather's original doughnut recipe. Before moving operations and opening a real store front at 379 Grand Street (seen above) on the Lower East Side, Mr. Israel converted the basement of a Lower East Side Tenement Building into a bakery. He would spend nights making doughnuts and deliver them in the morning via bicycle. Before he knew it, famed places like Dean & Deluca and Balducci's (as well as many other coffee shops) started to buy doughnuts from Doughnut Plant. 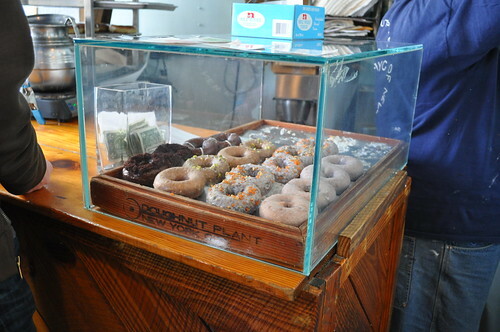 As detailed on the Doughnut Plant's official website, Mr. Israel developed "his own techniques of doughnut making during this time, while incorporating the original idea of using fresh seasonal fruit and fresh roasted nuts in his glazes." Subsequent to opening this location, Mr. Israel expanded his neighborhood bakery globally to Japan, where it currently has nine locations, with a Japanese partner, Jun Goto. He also developed his own recipes for what he calls "cake doughnuts" (you'll see what these are later) and makes homemade jelly for Doughnut Plant's jelly-filled doughnuts. When we arrived, there was a bit of a line, but this didn't intimidate us one bit. After having waited two hours for pancakes at Clinton Street Baking Co. prior to coming here, any wait shorter than two hours wasn't that bad, haha. 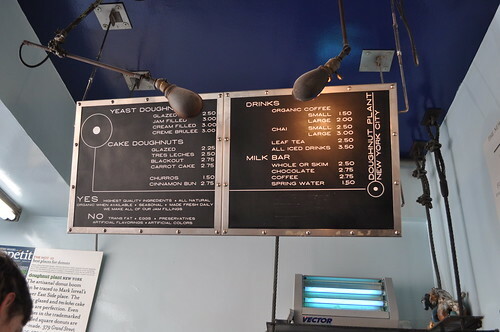 I like how the interior of Doughnut Plant maintains an industrial feel from the word plant in the bakery's name, with the visible duct and old factory-looking steel fan above. Even the windows that look into the bakery's internal operations are framed with steel-colored nuts and bolts, adding to this atmosphere. 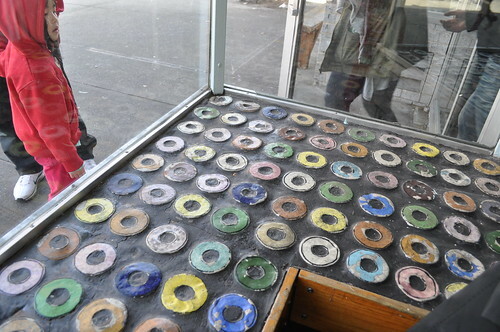 There are also doughnut patterned seating areas for patient doughnut patrons to sit while waiting in line. The menu at Doughnut Plant. 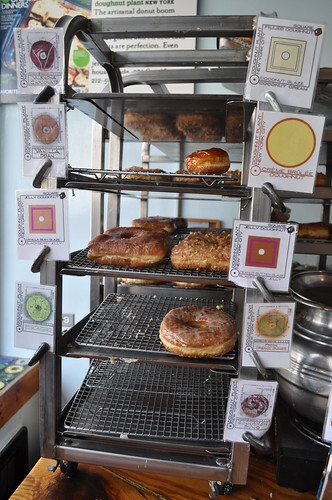 Notice the two different doughnut offerings on the menu: yeast doughnuts and cake doughnuts. The menu also offers churros, which I will definitely consider ordering during my next visit! More doughnuts on these super industrial baked good racks! I also like the little cards with a drawing/picture and a description of the doughnuts. And square jelly doughnuts--who knew?! I decided to go with one cake doughnut and one yeast doughnut in order to fairly assess both types. This one here is the crème brûlée doughnut (classified as a yeast doughnut). These "raised" doughnuts are leavened with yeast and allowed to rise at least once before being fried. On a random note, I just recently found out that crème brûlée is French for "burnt cream"--what a perfect name for it! 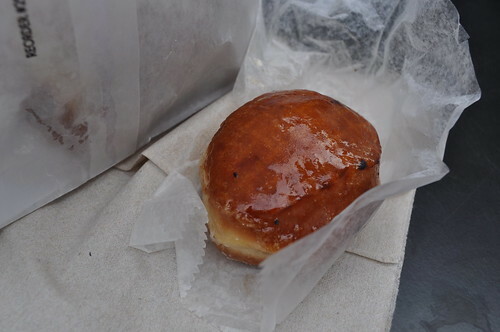 Anyways, the doughnut was filled with the dessert's traditional custard (I recall it having a hint of vanilla in it). For the part of the traditional crème brûlée that is sprinkled with sugar and broiled to a fragile, thin caramelized crust with a blowtorch, the doughnut's exterior had a hardened glaze, mimicking a crème brûlée's crust to a tee! It was a lovely surprise (and transition) from crème brûlée typically served in a ramekin into doughnut form! It was the perfect amount of sweetness and richness, tasting almost like a beignet, just without the confectioners sugar but with a slightly hardened exterior. I would love to come back to have another one of these! Jess had the classic glazed doughnut (also a yeast-based one). She reported to me that this was a fabulous doughnut! Yum! For my second doughnut, I went with the tres leches cake doughnut. As opposed to yeast doughnuts, cake doughnuts receive their leavening power from baking powder and are chilled before frying to prevent the dough from absorbing too much oil in the process. As the name implies, this doughnut was modeled after the traditional tres leches cake, which is a sponge cake that is soaked in (you guessed it) three kinds of milk including evaporated milk, condensed milk, and heavy cream. 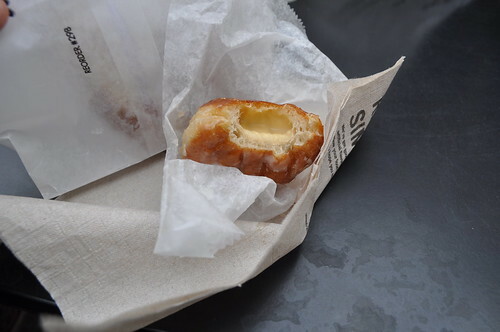 It was a very densely flavored doughnut (probably because of the three types of milks used), which would've been more enjoyable if I hadn't waited to eat this doughnut much later in the day. 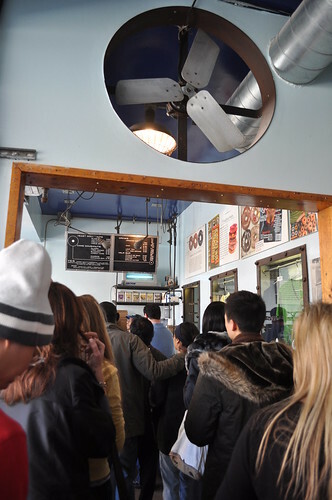 We were still so full from brunch at Clinton Street Baking Co. that we just walked over to Doughnut Plant to pick up a few doughnuts to save for a later afternoon snack. 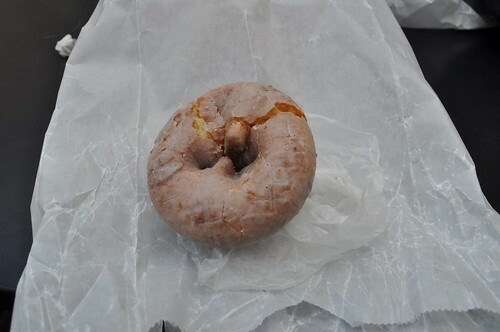 Nevertheless, I could tell it was a better doughnut earlier in the day when I picked it up at Doughnut Plant. Findings: I enjoyed our visit to doughnut plant. Surprisingly, the line wasn't too long--we waited about 10 minutes. The turnover of customers is steady and always moving along, so there should be no big hold-ups. In either case, I would recommend getting there early, to beat any large crowds! Plus, maybe you can catch some doughnuts coming right out of the oven! Also, I highly recommend eating the doughnuts as soon as possible before it loses its structural integrity. My tres leches doughnut was a little soggy after a couple hours, and I knew I would've enjoyed it more if I had just eaten it earlier. I would say the crème brûlée is definitely worth getting (probably one of Doughnut Plant's signature offerings), and the glazed is a safe doughnut to get if you're picky about food. Who can hate a nicely glazed, plain doughnut? I'm definitely going back to the LES location for the churros and other novelty flavored doughnuts, and I would also like to make a stop at the one in Chelsea, which I heard has some original offerings not available at the LES location! Will 2011 be the year of the doughnut as last year was the year of the macaron for me? Stay tuned to find out! Price point: $2.50-3 for each doughnut.